This is my 4th pillow for the SYTYC Thrift Store Challenge. This pin tucked design itself wasn’t that hard to do, but working with satin was kind of a pain, as well as photographing the satin!!! But it’s lovely. 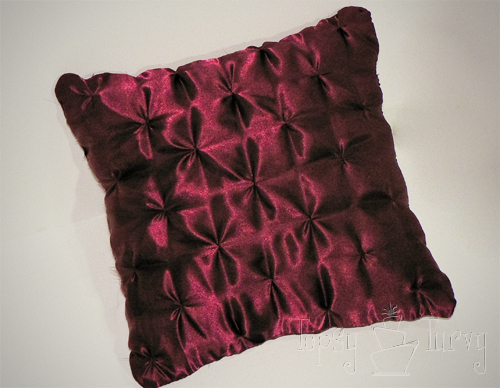 Its a great wine color, again a color that matches my back-splash and the other pillows great. It also matches the color of my favorite picture frames! This was actually a bedsheet I found at my local thrift store! What a great find! AND I have plenty left an a few other ideas of what I could do with it! 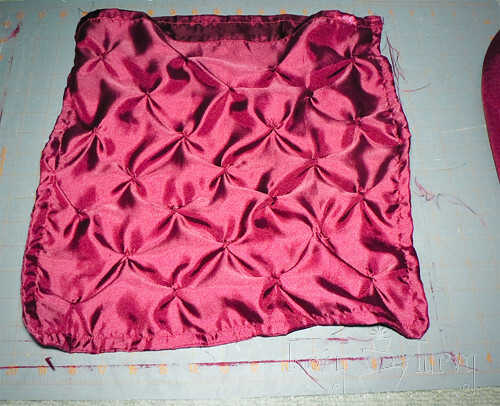 I started doing the pin tucking in one corner of the bedsheet and working my way in until it was the right width to cover the pillow form I had. 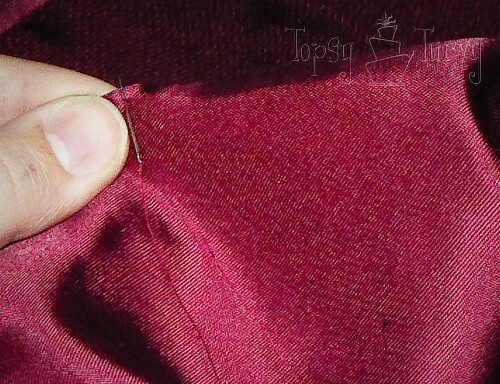 To start the pin tuck I pinched the area I wanted to work with, and stuck in the needle. 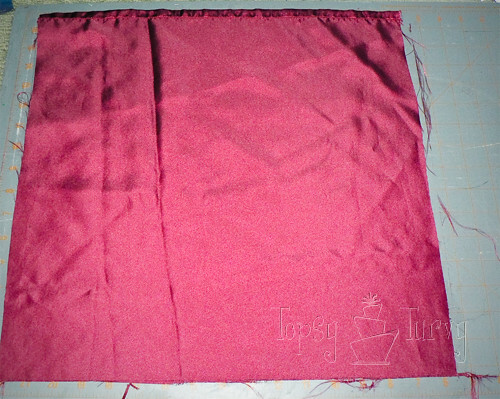 Then I folded the area over the needle, and pulled it all the way through, then stuck it into the fold, this time through 4 layers of fabric. Next I wrapped the thread around the corner I created a few times. Then stuck the needle back in and finally knotted it! Then I moved over a few inches and did it again! This is what it looked like when I got it large enough to fit over the pillow. I cut another square the same size for the back. THEN turn the pillow around putting the RIGHT sides toether this time, and sew around the edges again (keeping the same opening.). This encases all the frayed edges inside so they won’t catch, fray or get pulled. 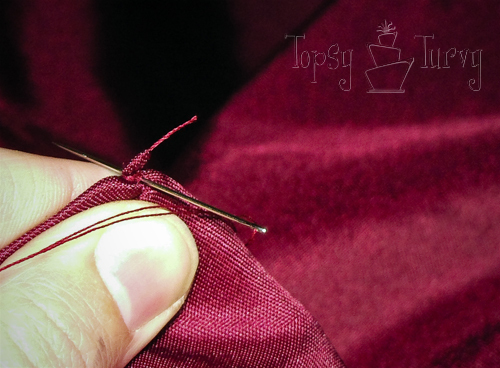 Then turn it inside out again, SHOVE the pillow in and hand sew your opening closed! Very nice! 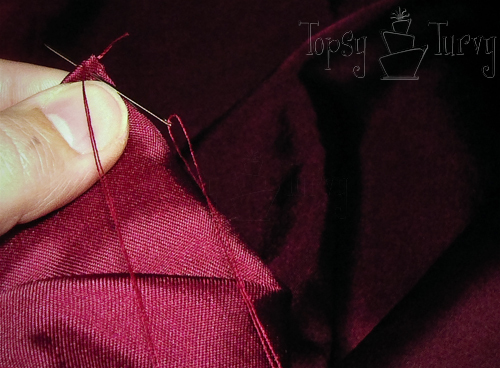 I like the pin tuck, looks alot quicker and softer than smocking. Thanks! I do like smocking with the right fabric and project. But for a pillow this was a great way to go! So nice to see your method for adding pintucks. The pillow is lovely. Thank you so much! There are probably better ways, but this worked for me! I love this! so elegant. I can’t believe that you did all that detail by hand! Thanks! It actually didn’t take very long at all. I just watched HULU while working and then it was done! This was the first picture which appeared when I Googled “needle-tucked pillow tops,” and the stitches seem to be the pattern I was looking for. 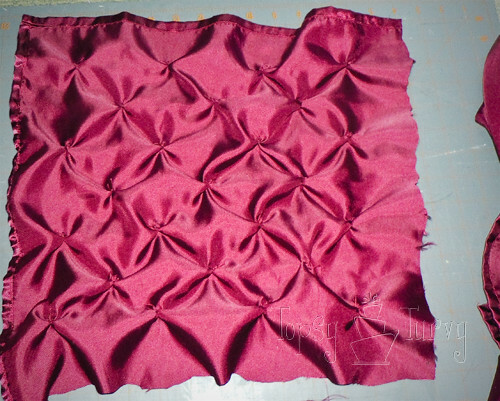 I am not at all talented in crafts, but I’ve been wanting to do a post on this kind of pillow. My blog is mostly about my growing-up WAY down South, and there was the most bizarre sort of cultural phenomenon going on back in the Seventies. These pillows sprang up EVERYWHERE, as if folks were turning them out in assembly-lines. They were usually made of cotton, perhaps 16″ square, and the fabric was always a check—and the colors in the Seventies were so DRAB, somehow, all those browns and duns and rusts and burnt oranges. Having never seen the fabric itself, I have no idea if the original check was 1″ or 2″, for the stitches must have been made corner-to-corner, to make those little flanges stand up like wings. And of all things, they were not chair-cushions, nor did I ever seen one in someone’s home—they were always laid up into the back windows of cars, right up there behind the back seat, fading in that glaring Delta sun. It was just the oddest thing to me—I KNOW my family didn’t have one, but it seemed that every car-owner for MILES must have made or bought one, for they were EVERYWHERE. 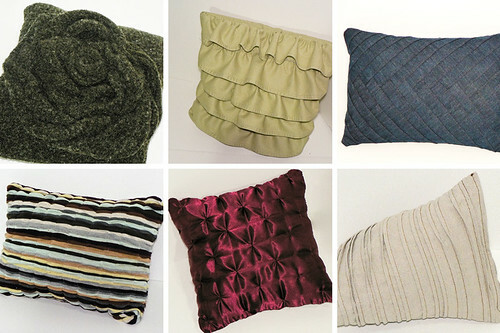 Do you perhaps have some history of that strange pillow-frenzy, or even a pattern in one of your craft books? It’s just a silly thing I remember, and I’d like to post about them someday—if I cannot find one of the check images, might I perhaps use your photo as illustration of they way they were made? Thanks—I know this was a while ago, but you seem to be the very first on Google’s list, and this one’s beautiful. you are more than welcome to use one of my images and link to my post, but no more than one. And i’ve never seen the checked ones, it sounds interesting! Nice pillows for good prices! 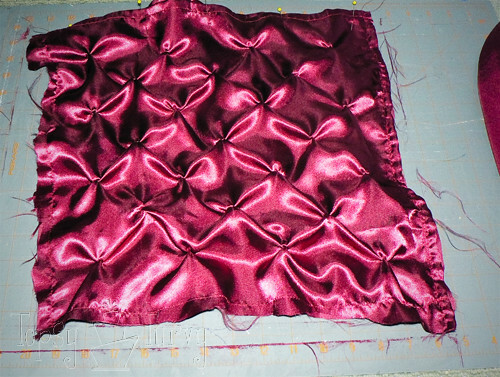 I do have a question about the directions on the satin pin tucked pillow. Under the third picture in those directions there is a typo–“Then I folded the ARE over the needle and pulled…” What is the word “ARE” supposed to be? I don’t understand exactly what you are trying to explain because of that word that doesn’t seem to fit. Thanks! AREA, that are should be area. Does that help?